Chick & Egg ** Free! Although this pattern is free to download, the copyright restrictions still apply. While you're here, why not check out the other patterns on the Toy Patterns page? 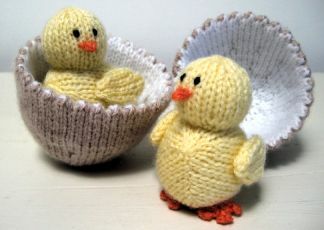 They start at £2.50, and there's bound to be something you would like to knit! Measurements The chick is 7.5cm/3in tall, and the egg is 12.5cm/5in tall, 7.5cm/3in wide.